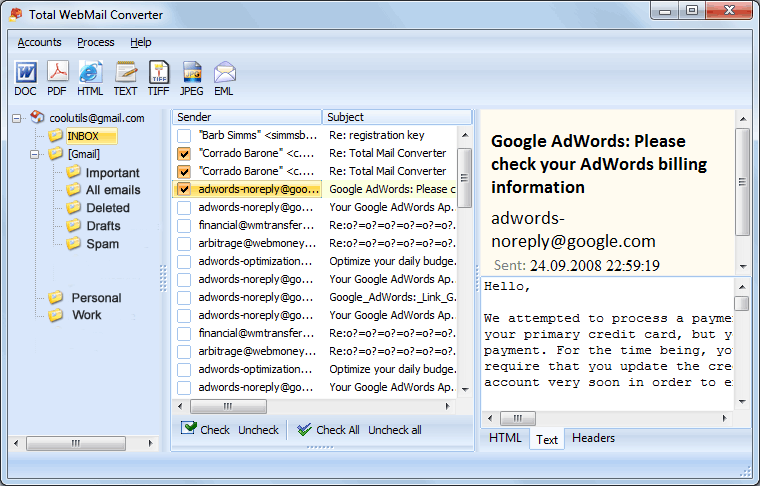 Gmail Emails with attachments to PDF, DOC, HTML, EML. Convert Gmail, Yahoo emails with attachments to PDF, DOC, TIFF, HTML, EML. Total Webmail Converter Pro can retrieve emails directly from your POP3 account and convert them to PDF, HTML, DOC, TXT, TIFF, JPEG and RTF. The Pro version can also export attached files to the output format. Convert emails directly from Gmail, Yahoo, Exchange, Outlook.com, AOL, Lotus and Windows Live without having to export them first! The interface is very straightforward. Enter your account information and the program automatically locates your messages. You select the target format, define additional options and get the neat documents in minutes. 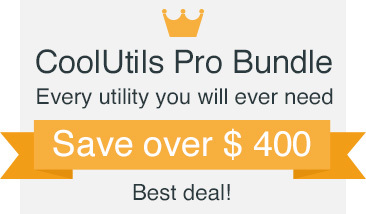 Convert all your folders with thousands of emails in one go. Archive emails along with attached files to PDF, TIFF, DOC, HTML, TXT or JPEG. Give resulting files new descriptive names to easily sort them by date or sender. Add pagination to every page of the output file or stamp bates. More options..
Archive old emails from Gmail or Yahoo or Windows Live with the unique Total Webmail Converter Pro. No other email converter can process attachments the way it does. Download the free evaluation copy and test the app for 30 days now. "We use Total Webmail Converter to archive Gmail emails to keep things in order and are quite happy with its performance. It took a while to connect to Gmail inbox (Gmail has a crazy policy about third-party apps) but once it was settled it worked like a charm. The attachment option is truly great." "Total Webmail Converter was the only program I found to stamp bates to Windows Live emails. It saved me hours of work. Now I export emails to PDF and stamp bates in a single pass. For me Total Webmail Converter is well worth the price. I have no suggestions as for now. Thank you!" 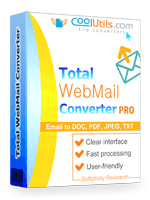 Total Webmail Converter Pro converts emails from Gmail, Yahoo, Lotus, Outlook.com, Windows Live Mail, etc. with attachments. Migrate to Office Outlook easily! Convert your emails into one PST file. For your convenience Total Webmail Converter Pro can merge several emails into one multi-page PDF, DOC or TIFF file. Sometimes emails contain links to images in the web. Total Webmail Converter offers not to access internet for images option to save your time and get rid of unwanted images. 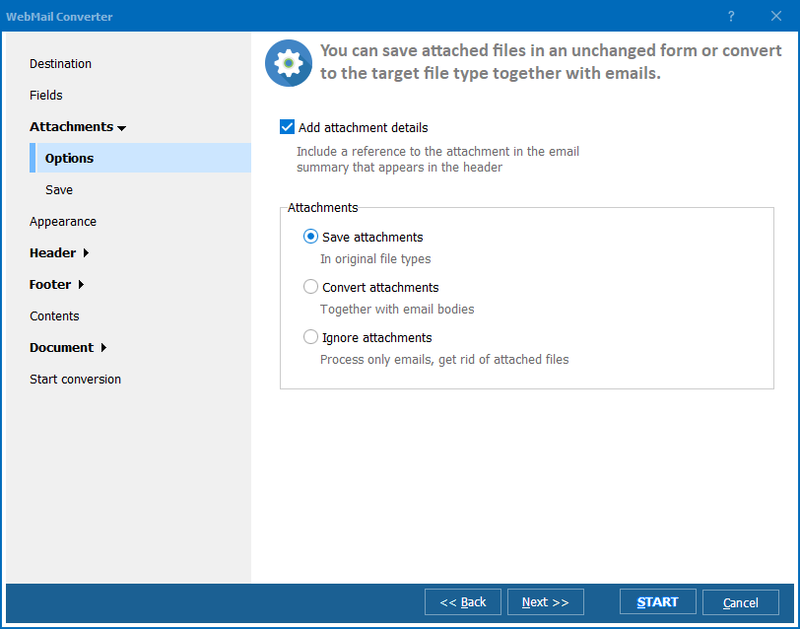 Attachments can be converted to the output formats as well as emails. Alternatively you can keep them in their original formats and place to a folder of your choice. Get detailed fact files based on your emails. Sort them by the sender, date, subject, or any other email field. Add or remove any columns. The reports are available in PDF, TXT, CSV, HTML, XLS formats. Total Webmail Converter Pro has a very user-friendly interface with lots of tips for beginners. You will never be lost. Output file types include DOC, PDF, XPS, HTML, XHTML, TXT, TIFF, JPEG, EML, PST. No other converter can do that! Export your emails to EML and then easily migrate to any EML-based email client. Empty your Yahoo or Gmail and archive old emails as regular DOC or PDF or TXT files on your hard drive. 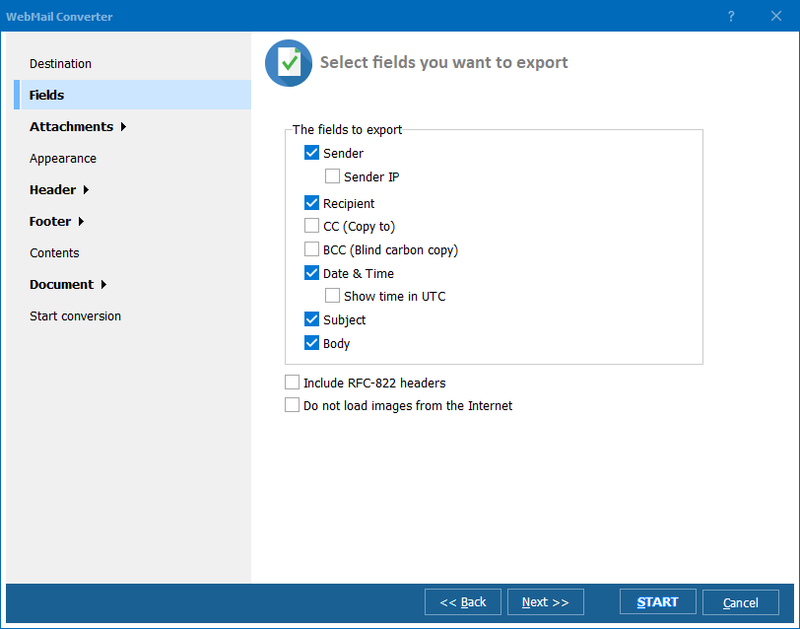 If you'd like to convert selected fields, Total Webmail Converter Pro will help you. It can export all email fields or just the ones you need (sender, date, subject, sender ip, etc). Do you have emails from different time zones? Tell Total Webmail Converter Pro to switch the dates to Coordinated Universal Time (UTC) to keep them in the right chronological order. When you convert emails to PDF, define what type you want: PDF, PDF/A and non-searchable PDF. Total Webmail Converter Pro also allows setting user permissions and sigining with a digital signature. Total Webmail Converter Pro can be run via command line. There is a special server version with no GUI.